I love highlighters and they are slowly taking over my makeup collection. 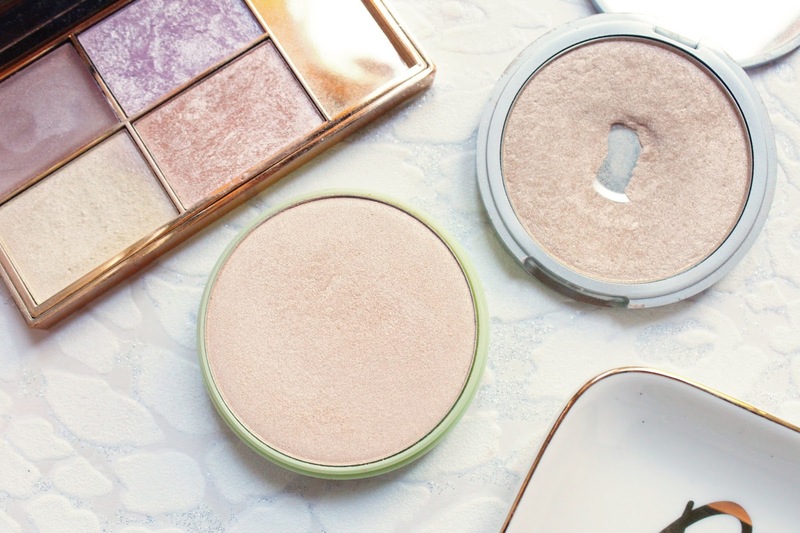 While I do have almost a full draw full of highlighters, these are my five go-to products when I want a good glow! I have a few different price points covered too if you are on a budget or looking for a splurge! One of the first highlighting products I purchased was the Sleek Solstice Highlighting Palette which gets so much hype from the likes of Jaclyn Hill and I completely understand why as it is a stunning palette. Inside the gold reflective palette are three powders and one cream highlighter. While I like all of the shades in the palette, my favourites are the bottom two which I love to mix on the cheek bones. The powder shades are super soft and sit nicely on the skin. Another mid range priced highlighter I have been using a lot lately is the Pixi Glow-y Powder in Santorini Sunset. This does retail for £14 but I paid around £11 from Look Fantastic as they always have a discount code floating around. This is a super glowy powder and illuminates the skin for a slightly more natural looking highlight. It isn't most long lasting on the skin but I have been obsessed with it for the past couple of weeks. 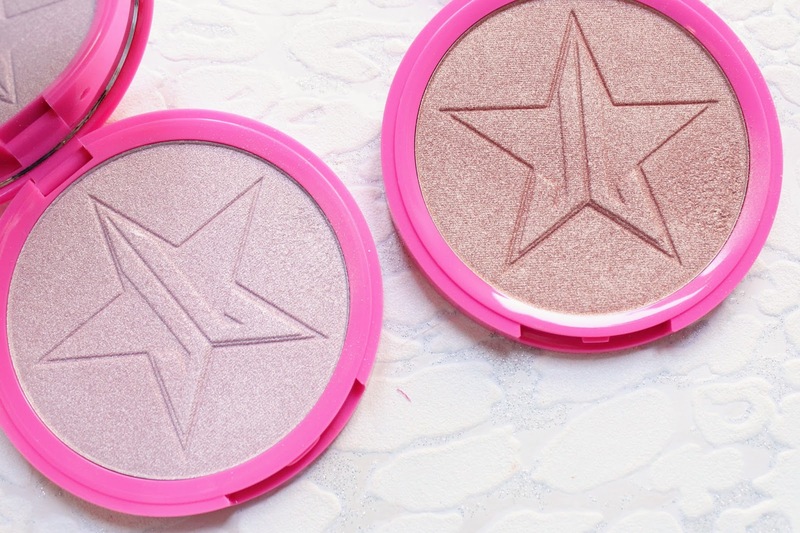 Then we have the Jeffree Star Skin Frosts in Princess Cut and Peach Goddess. Love him or hate him, he knows how to formulate a highlighter! These highlighters are huge so definitely worth the £23ish price tag. 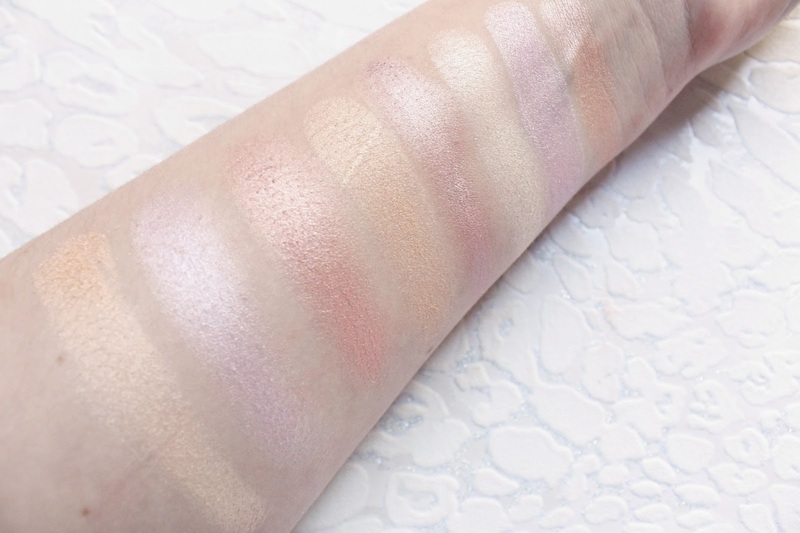 Princess Cut is a gorgeous baby pink highlighter which I love on my lighter skin tone and when paired with the Benefit Shy Beam it looks incredible and Peach Goddess us a lighter peach highlighter which Chelsea got me for my birthday and I love mixing it with a little of Ice Cold. These highlighters will give the skin a glow you can see from space and are incredibly long lasting on the skin. 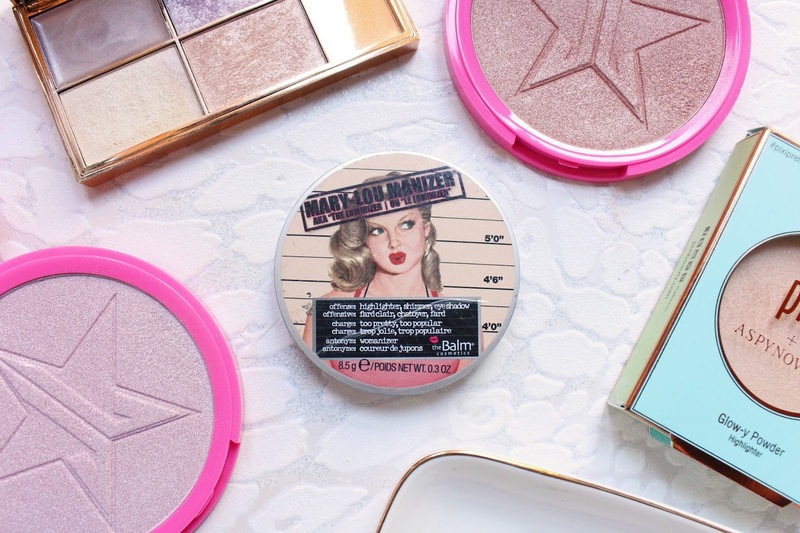 To make these even more intense, or for any highlighter in fact, apply with a damp brush! My go to everyday highlighter is theBalm's Mary Lou and you can see how much I have used it as I have actually hit pan! This is a lighter, warmer toned gold highlighter that adds a serious glow to anywhere you apply it but looks slightly natural on the skin. It doesn't highlight any texture on my skin and is very long lasting, some days all my foundation will have disappointed but my highlighter is still going strong! Depending on the highlighter and how much of an intense glow I want that day will depend on the brush that I use. I have found the Zoeva 114 Luxe Face Focus and Real Techniques Bold Metals 300 to work the best with the Jeffree Star Skin Frosts. But for any of my other highlights I switch between the Zoeva 129 Luxe Fan and the Zoeva 134 Luxe Powder Fusion.